Quattro Tires Inc. offers you the possibility to find and learn more by using different search methods. First of all, it is possible to search by size by simply using the “By Sizes” box located on the homepage of the website and selecting among the different possibilities, the tread width, the profile and the diameter of the tires you wish to look for as shown on the example on the homepage of the website. For more information, refer to the section (help). Once you have selected the tread width, profile and diameter of the tires you wish to search for, you must identify which type of tire you wish to see. You may either select a winter tire or a four seasons/summer tire. Once you have selected one of the two choices that are presented to you, you will find yourself on the page where all the different makes and models in the appropriate size are presented to you. The different models will be classified by availability and price range from the least expensive to the most expensive. On this page you will be able to compare and to learn more by selecting a tire and getting a detailed description, an enlarged picture of the product and an evaluation of each of these makes and models according to different criteria’s. Secondly, Quattro Tires Inc. offers you the possibility of researching by tire brand. Again starting from the homepage of the website, you may research your tires by selecting the brand of your choice by selecting the appropriate logo. Once you have selected the appropriate brand, you will have to choose what type of tires you are looking for either a winter or a four seasons/summer tire. The next step in order to narrow down your research, you will be asked to identify witch type of vehicle you are researching for between a car/automobile or for a light truck/SUV. After selecting witch type of vehicle you wish to search for, you will find yourself on the page where you will be presented with all the different models of tires available in the particular brand, season and type of tires you chose. By selecting a particular model of tire you will once again have access to the description, enlarged picture, evaluation but also all the different sizes Quattro Tires Inc. has in stock. Finally by selecting the size you need for your vehicle, you will be able to proceed to the next step witch is purchasing the tires. The third research method offered to you by Quattro Tires Inc. is a search by vehicle. You simply have to select your vehicle brand, model, year and edition. It is important to note that the tire guides may not have all vehicles editions and sub models and it is always recommended to confirm the size on your vehicle directly. Following your search and once you have found the tire model you wish to purchase, it is important that you make sure the tread width, profile and diameter correspond with the ones for your model of vehicle. Once the tire sizes have been confirmed to be compatible with the vehicle, the customer will be able to purchase tires by selecting the desired model and clicking on the button “Add to cart”. Once you have selected the button “Add to cart” you will be directed to the “Cart”. On this page the customer will have to confirm the amount of tires they wish to purchase and the shipping postal code in order to know the final price of their transaction including shipping (depending on location), eco taxes and sales taxes. Once the customer has acknowledged the different costs and modalities, such as sales conditions and shipping conditions and has accepted them, they may select the “Proceed to Checkout” button bellow the grand total of the transaction. On the next page the customer will have to fill in the different fields in order to provide us with certain information such as billing address*, shipping address, first name, last name etc… in order to submit and confirm the transaction. Finally the customer will be able to proceed with the payment. It is important to take note that by using this entirely secured page by PayPal and the SSL protocol, Quattro Tires Inc. does not have access to any banking information such as credit card numbers for example. Once this information is completed the customer may submit his or hers order by selecting the button “Confirm order”. If the order and payment information has been well entered, the customer will receive a confirmation message as well as the order number of their purchase which can be used to trace the transaction. The customer will also receive a confirmation email, including details of the transaction and a copy of the invoice which can be used as a proof of purchase. If the transaction happens to fail or is declined, we invite you to verify the information in the order form and make sure that they are correct. If you have issues with the form, please contact Quattro Tires Inc. and a member of customer services will help you determine the cause and guide you to finalize your purchase. *It is mandatory that the billing address is the one associated with the payment method used. Once the transaction has been completed, the tires purchased by the customer will be shipped out in a delay of three (3) to seven (7) business days, beginning the day after the transaction. Wheels and tires are generally shipped between 8h00 and 17h00 but can in some occasion be shipped until 20h00, depending on the time of the year. Quattro Tires Inc. will contact customers on the day preceding the shipment in order to confirm the transaction and the estimated delivery date. 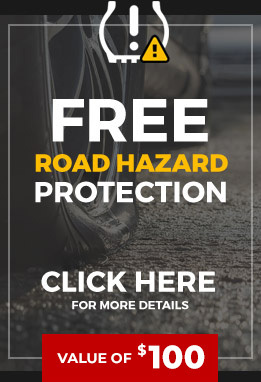 Quattro Tires Inc. can deliver the tires and/or wheels at the customer’s place of residence, work place, an affiliated garage or even the customer’s local installer. Even if an estimated date of delivery is provided, Quattro Tires Inc. cannot confirm a precise hour or delivery exceptions. In this case the customer has the responsibility to make sure someone will be present on the shipping date or that a safe location* is provided so the transporter can deposit the tires safely if no one is present to receive the order. In order to confirm the reception of the tires someone must be present at the shipping address to sign and take possession of the merchandise, if no one is present, the safe location given will serve as an authorisation to leave the tires unattended at the customer’s residence. * The safe location may be entered in the cart, in the commentaries when proceeding with the order or by phone, with our representatives. Quattro Tires Inc. cannot be held responsible for theft, lost tires, damage to the property or any damage to the merchandise between the time when the tires are delivered and the time the customer actually takes procession of the tires. It is the customer’s responsibility to verify the merchandise received and to make sure that it corresponds with the customer’s order. In the case of an error made by Quattro Tires Inc. it will be corrected by shipping the right merchandise back to the customer and returning the wrong items. Quattro tires Inc, is cannot take responsibilities for mistakes made by the customer, such as but not limited to: a mistake in tread width, profile or diameter of the tires, wrong addresses, refusal of delivery, absence at the time of delivery in those cases additional fees may apply.